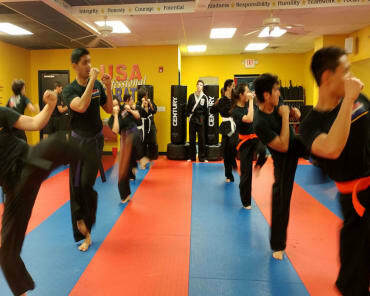 Learn karate for self-defense, physical fitness, and character training in a fun, positive and motivating atmosphere with our Adult Karate Classes at USA Professional Karate Studio. Designed for students 13 years and older, these classes are perfect for all martial arts experience levels. Karate: Includes learning Kata, which is a prearranged series of punches, block, and kicks put together as if fighting imaginary opponents. Kata develops memory, mind and body coordination, concentration and fitness while giving the student a forum to perform, either individually or in a group, with creativity, expressiveness, personal style, power, and grace. Kickboxing: Incorporates the use of basic techniques and sparring combinations on pads, shields and kicking bags for developing speed, power and proper execution of skills learned for fighting. Techniques are also practiced with partners to develop proper reactions and responses, timing, and recognition skills. Weapons: Learn how to properly and effectively use the Nunchaku, Kama, Sai, Bo, Escrima Sticks, Broadsword, Tonfa, and the Bokken. All of the above offer a fun and exciting way to develop physical fitness, flexibility, and strength. Karate class is always an excellent way to build muscle, enhance cardiovascular endurance, burn calories and feel great. 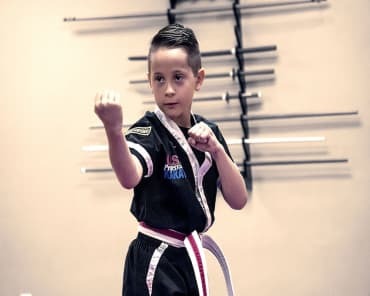 Our Karate studio culture is one that promotes character development such as: respect, discipline, focus, self-control, goal setting, perseverance, confidence, and more! These character traits learned and practiced in class and carry over into all aspects of life. Students learn to be high achievers: to set goals and achieve them in karate and in all areas of their everyday life. Thus, they become a black belt in life! Join The Team At USA Professional Karate Studio Today! We're ready to help meet all of your fitness and self-defense goals through our Adult Karate Classes. Don't waste another workout on something that doesn't help you to be your very best. Just fill out the form on your screen now for more information or to get started with USA Professional Karate Studio today!